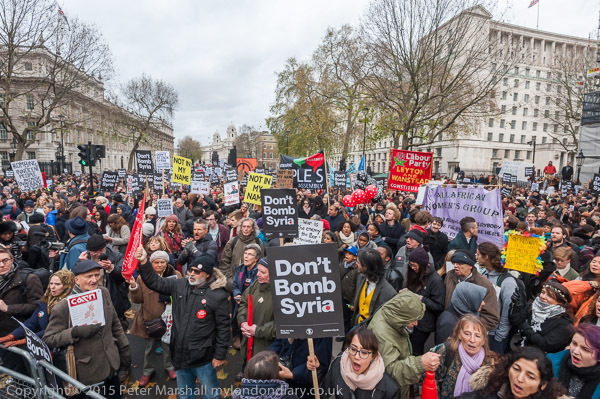 Don’t Bomb Syria was a big protest, attended by several thousand people, and obviously rather larger than the police had planned for, and it soon became obvious that their attempts to keep traffic flowing had been a mistake. 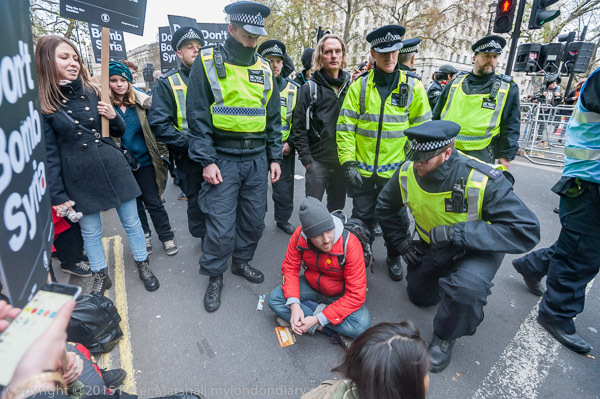 It’s hard to think of any road in London which is a vital route – there are always other ways to drive from A to B, and there are often closures for various ceremonial or sporting events, but sometimes the whole purpose of policing protests appears to be to keep traffic moving. The numbers present forced them to close the southbound carriageway a few minutes before the rally started, but they continued to keep traffic flowing northbound, having to keep clearing off groups of protesters who kept coming onto it from the pavement to get closer to the speakers. Finally enough people decided they had had enough of the police action and a large crowd moved on to the road and after a while sat down and blocked it. London has been very slow to take the obvious move of pedestrianising some of its central areas; while many suburban high streets are now traffic-free, Oxford St is still full of traffic and Parliament Square remains a large traffic island. 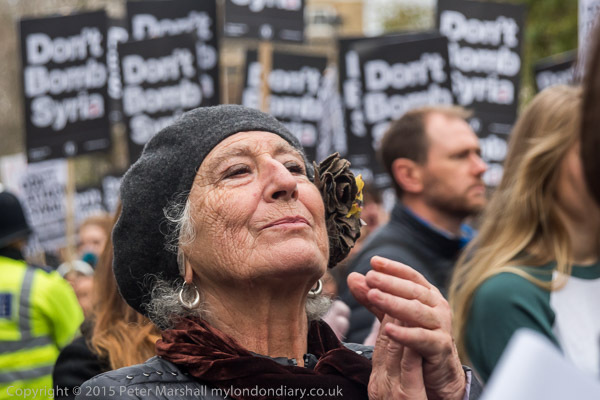 Almost everyone feels that Trafalgar Square is so much improved after the North Terrace was finally pedestrianised in 2003 – except for the National Gallery, which is upset by the buskers and ‘living statues’ who lower the tone by performing there. Much as I hate ‘living statues’, and would certainly welcome some form of cull, it is far more pleasant now than when the area was full of buses, lorries and diesel fumes. 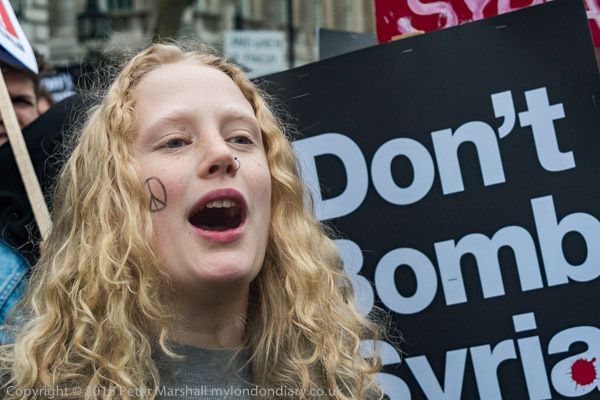 I wasn’t happy with some of the speakers at the protest, although I agreed that a military intervention by the UK at this time was unlikely to have any positive effect. We should have acted much earlier, though not directly, rather than speaking in support the Syrian opposition and against the dictator Assad but refusing to give those who opposed him any material support. While the Russian position perhaps made it impossible to act directly it would have been possible to find ways for the Syrian rebels to have much more effective defence against the air attacks of the Syrian regime, and to stop the huge oil exports, mainly smuggled through our ally Turkey which have largely financed ISIS. 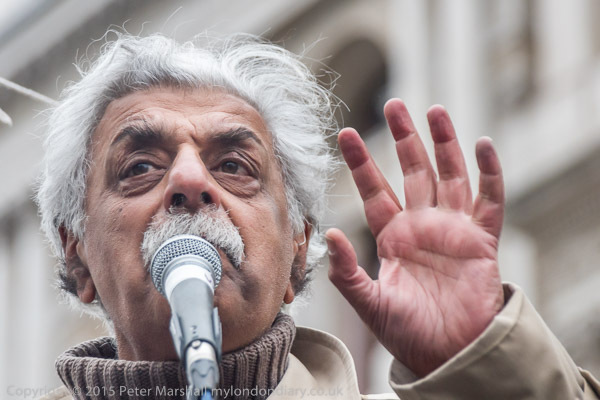 What I waited for in vain as I photographed the speakers at the event was for anyone giving a view from the Syrian opposition – instead we got many of the same speakers who get paraded at every Stop the War protest. Some of them are worth listening to, others too predictable to be really worth the effort. And several did stress the need to take effective action about the Turkish oil smuggling that is funding ISIS – something the Russian bombing and press releases have made us all aware of. 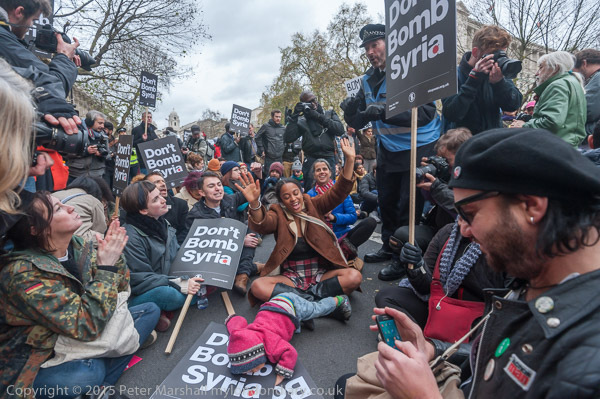 Eventually I lost interest in the speeches and concentrated on the large group by now blocking the road, as you can see in the third part of my report: Don’t Bomb Syria Blocks Whitehall. After around an hour, people were beginning to leave, and the arrival of more police who then went around telling people they would be arrested if they continued to sit in the roadway fairly quickly persuaded the others it was time to end their protest. This entry was posted on Thursday, May 12th, 2016 at 09:54 pm and is filed under My Own Work, Photo Issues, Political Issues. You can follow any responses to this entry through the RSS 2.0 feed. You can leave a response, or trackback from your own site.